Directed by John Carpenter and written by Carpenter and Nick Castle, Escape from New York is the story of a former soldier who is tasked to rescue the President of the United States of America in a crime-ridden world in 22 hours. 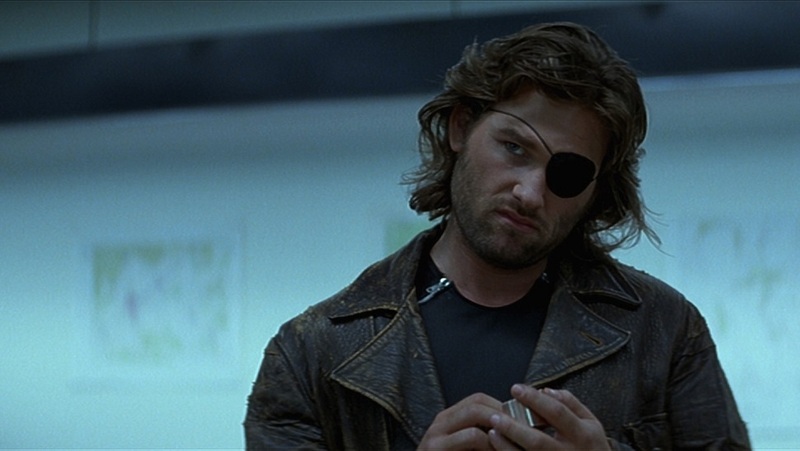 Set in a futuristic and dystopian New York City, the film is an exploration into the world of terror and chaos where a man named Snake Plissken has to save the day as he’s played by Kurt Russell. Also starring Lee Van Cleef, Ernest Borgnine, Isaac Hayes, Adrienne Barbeau, Harry Dean Stanton, and Donald Pleasance as the President. Escape from New York is a riveting and exciting film from John Carpenter. After a massive rise in crime in America which led a mass evacuation of Manhattan Island in New York City where the island has become a prison. The film revolves around a former soldier who is asked to rescue the President of the United States of America whose plan has crashed in Manhattan Island after it was hijacked by a terrorist group. It’s a film that isn’t just a rescue movie but also a dystopian film of sorts as it plays into this renegade named Snake Plissken who has 22 hours to save the President who is supposed to give a speech in the hopes of ending a conflict with China and the Soviet Union. Upon arriving to Manhattan where he is also carrying a virus that would kill him if he doesn’t bring the President in time, Plissken also has to endure the many things that goes on in Manhattan including a prison leader known as the Duke (Isaac Hayes). The film’s screenplay by John Carpenter and Nick Castle play into the stakes of what is going on as it is clear how troubled the United States is where everything outside of Manhattan Island is surrounded by a wall. Attempts to escape the island means certain death as anyone who is in the island is stuck no matter who that person is. This would add a lot to what is happening in the film as retrieving the President in an island full of criminals as he’s not the only one that isn’t safe but anyone else who tries to help him is safe. This prompts the country’s top police chief in Hauk (Lee Van Cleef) to bring in Plissken who was a former soldier that was just convicted for a robbery attempt on a Federal Reserves building. Plissken however is reluctant to do the job which plays into the complexity of his character as he is essentially a loner that is very distrustful of government and authority. 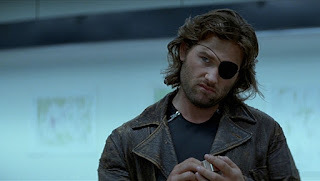 Once the second act is set in the island, it is clear that Plissken is in a world that is very different but is able to deal with the situation. It’s just that he’s dealing with people who are essentially nutcases as well as someone like the Duke who runs the city though there are a few such as a cab driver (Ernest Borgnine), an old friend of his named Brain (Harry Dean Stanton) who is the Duke’s advisor, and Brain’s girlfriend Maggie (Adrienne Barbeau). There, Plissken would have to survive with their help to save the President but it’s not just the life of the President that is at stake but also what he is carrying his briefcase which would play to the fate of the world. Carpenter’s direction is very entrancing from the way he opens the film to the moment he reveals what goes on when a couple of men try to escape the island. It sets the tone for what is to come as there is this element of suspense once it becomes clear that the President is in the island and being held hostage. While much of the film is actually shot on locations in St. Louis and Los Angeles plus a few moments in New York City and Atlanta with additional scenes set in soundstages. It would play into the sense of despair that is in Manhattan where it looks like a city in complete ruins and being out on the street at night is very dangerous where no one is safe. Carpenter’s usage of wide and medium shots help play into that sense of danger while he also knows how to build suspense into what Plissken is saying. While the film may be a futuristic sci-fi dystopian film, it has elements of the western since it involves some showdowns and a man’s instinct to survive. At the same time, Carpenter creates these moments where the violence is disconcerting but not really graphic as it’s more about what could happen and how far some are willing to go. The film’s climax where Plissken and the President are escaping is quite thrilling as it plays to not just the sense of danger of the island itself but what will happen there are those who will try to find a way to try and reach the wall. It does lead into an aftermath that plays into not what Plissken was doing but also into the fact that he realizes that there is a bigger picture which doesn’t really involve him. Instead, it plays into his own cynicism and how he would contend with that. Overall, Carpenter creates a gripping yet adventurous film about a renegade who goes to Manhattan to save the President from a bunch of crazed thugs. Cinematographer Dean Cundey does excellent work with the film‘s very dark yet eerie cinematography which plays into many of the interior/exterior scenes where a lot of it is set at night with some more vibrant colors for some of the daytime sequences. Editor Todd Ramsay does amazing work with the editing as much of it is straightforward to help build up the film‘s suspense along with some fast-paced rhythmic cuts for the action sequences. Production designer Joe Alves and set decorator Cloudia Rebar do fantastic work with the look of New York City as well as the scenes set in the prison base. Costume designer Stephen Loomis does nice work with the costumes as it‘s quite stylish in the ragged looks of Plissken and the characters at the island. Special effects supervisor Roy Arbogast and the visual effects work of William L. Arcane do terrific work with some of the effects for some of the film‘s action scenes as well as some computer-based images that includes some contributions by James Cameron on the special effects. Sound editor Warren Hamilton Jr does superb work with the sound to play into some of the sound effects and eerie tone for the scenes set in the island to play up its suspense. The film’s music by John Carpenter and Alan Howarth is brilliant as it is largely an electronic-based score with low-key yet brooding synthesizers to play into the mood of the film while the soundtrack features the swing classic Bandstand Boogie which the cab driver likes to play. The film’s cast is incredible as it features some notable small roles from wrestler Ox Baker as a man Plissken must fight in the island, Frank Doubleday as the Duke’s assistant Romero, Tom Atkins as Hauk’s assistant Rehme, Charles Cypher as the Secretary of State, Season Hubley as young woman Plissken meets at the island, and voice appearances from producer Debra Hill as a computer and Jamie Lee Curtis as the film’s opening narrator. Adrienne Barbeau is fantastic as Maggie as Brain’s girlfriend who aids Plissken in getting the President while Harry Dean Stanton is superb as Plissken’s old friend Brain who also helps as he realize what is at stake while being one of the few that knows how to get out of the island. Ernest Borgnine is excellent as an old cab driver Plissken encounters as he knows where to go and such as he would also provide some key things in the rescue. Lee Van Cleef is brilliant as Bob Hauk as the prison supervisor who asks for Plissken’s help knowing that he’s the only one that can do the job right as he also deals with the situation that is at hand. Isaac Hayes is amazing as the Duke of New York as a gang leader who holds the President hostage as he uses him as bait so he can get amnesty for himself and the other prisoners. Donald Pleasance is marvelous as the President as the leader who becomes a hostage as he tries to hold on to the contents of the briefcase which plays into what he really wants to do to end a worldwide conflict. Finally, there’s Kurt Russell in a phenomenal performance as Snake Plissken as this former soldier turned criminal who reluctantly takes the job to save the President for a pardon as he deals with his situation as well as what is at stake as he also carries a virus that will kill him. It’s a performance from Russell that is full of restraint but also a sense of cool as it is one of his most iconic performances of his career. Escape from New York is a spectacular film from John Carpenter that features a tremendous performance from Kurt Russell. The film isn’t just one of the most intriguing rescue/dystopian films ever made but also one of the most exciting in terms of its action and suspense. Even as it features one of the greatest anti-heroes to be presented in cinema in the character of Snake Plissken. In the end, Escape from New York is a rapturous film from John Carpenter. What a spectacularly cheesy movie this is. It's only passed in ridiculousness by its sequel, Escape from L.A. I love it. I didn't really love this at all. I mean, it's fun, to an extent, and has some thrills, but like Wendell said...this is cheesy. LOL...but these kinds of films are really not my thing. @Wendell-I didn't think it was cheesy. I just didn't take it seriously. Then again, a lot of Carpenter's films aren't meant to be taken seriously and that's why they're so fun to watch. @Fisti-Wow, you're not a John Carpenter fan? I feel sad now. I love this! I've never heard anyone have so much to say about this movie. And I definitely agree that so much of what Carpenter brings is presented in a way that's kind of teasing us - it's borderline. He's not really taking himself seriously, but is daring you to! @assholeswatchingmovies.com-Exactly. It's more about suggesting and knowing when to present thing at its fullest. It's so great. I'm glad someone else here thinks of this as great cinema. Right up there with BIG TROUBLE IN LITTLE CHINA as the most watchable of Carpenter's films. This film is just so great - a badass anti-hero protagonist, a gritty, dystopia, a moody electronic soundtrack and tons of quotable dialogue. I also love all the little details that flesh out this world and suggest so much going on in the margins. No wonder it is such the beloved classic.